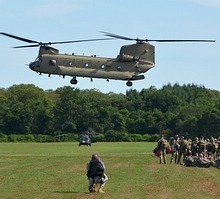 Dave O'Brien reports on the Leapfest international military parachute competition, held annually at West Kingston, Rhode Island. This was the 34th Annual Leapfest event, it was originally planned for Saturday the 5th of August but the weather wasn’t promising for later that morning into the afternoon so they had to cancel even before it got started. They regrouped Sunday morning at 9am and started the jumping right off with no opening ceremonies. The purpose of Leapfest is for training an Army Aviation group to deliver a force on a tactical objective on time and ready for combat. It consists of teams from the US Army, US Navy, USMC and international teams. Taking part in Leapfest 2017 were 38 teams from the US, 185 jumpers covering 14 States. For the international participation, they had 32 teams breaking down to 158 jumpers from 9 countries. Those countries were Botswana, Italy, Germany, Mexico, Canada, the Netherlands, South Africa, New Zealand, United Kingdom and the United States. The competition consists of 5 jumpers, 4 of which jump and one alternate. The jumpers exit the CH-47 Chinook from 1500ft (AGL) using a MC1-1C/D static line steerable parabolic parachute. This means the chute will open as soon as they leap off the deck of the CH-47, instead of free falling from a higher altitude and then deploying the chute at 3000ft. 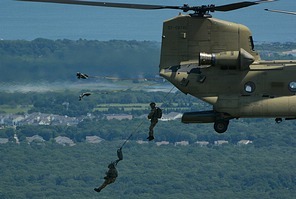 A jump master is in back of each Chinook and tells the jumpers when to exit over the drop zone. 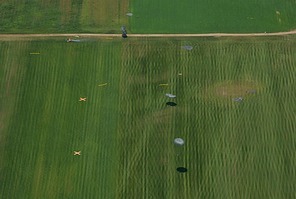 There are 3 orange X’s on the DZ which they are supposed to steer their chutes close to and if able to land on top of it. Once they land their timer starts and they need to run to the closest X. There are 4 spotters per pass that pick up a jumper once he leaves the Chinook and start their stopwatch as soon as the jumper lands. The timer is stopped as soon as they touch the orange X. The spotters combine the team’s time and the shortest time wins for the team and for the individual jumper. After each team has jumped they bundle up their chutes and bring them to a spot where another group will repack them. The jumpers then board a bus and head back for new chutes and board another Chinook to jump again. Each team jumps 4 times. The winning team was Team #3, D CO 2-160th SOAR (Abn) with a combined time of 17 seconds. The 2nd place team was #49 with 25 seconds. The winning Individual jumper was SSG Cameron Miles, D CO 2-160th SOAR (Abn), he was one of three jumpers that landed on the X and thus had a time of 0.00 seconds. I’m guessing he was the first so they gave him the individual win. Because the first Blackhawk rides ran long, by the time I got down from doing a few passes around the drop zone the competition was already over. My shots of the jumpers are from the friendship jumps where countries issue their Jump Wings to other countries. A special thanks to the Rhode Island National Guard PAO. For more images also see the Leapfest Facebook page.